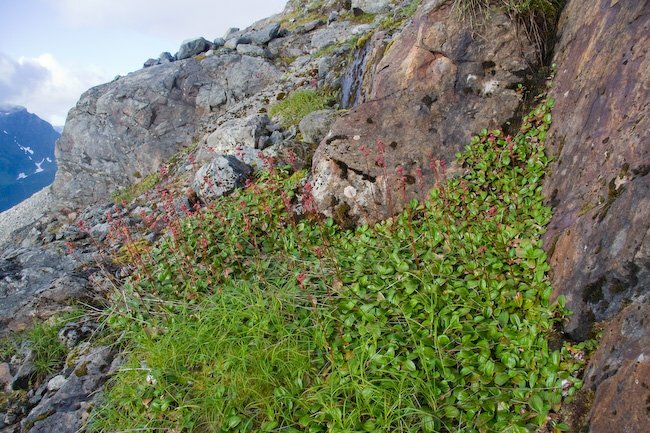 A lush patch of Leatherleaf Saxifrage (Leptarrhena pyrolifolia) growing in a seep on a rocky slope. I ended up with so many different plants I wanted to mention (and show photographs of), that I decided to break up my comments and questions into more than one entry. In this first entry I will give an overview of my observations and thoughts, with an emphasis on plants that I had seen before. In subsequent entries, I will focus on plants that were new to me, including a some I do not have identifications for yet. September is pretty late in the season for most flowers, and I did not really notice any down low, but then I was not really looking. With the heavy/late snow this year, I was hopeful to see at least a few flowers in the alpine. As it turned out, I did see a few, but I probably would have seen a lot more flowers 3-6 weeks ago. Still, given the lateness of season, I really can’t complain. There were a few of the typical subalpine meadow species in bloom just at the edge of the treeline. 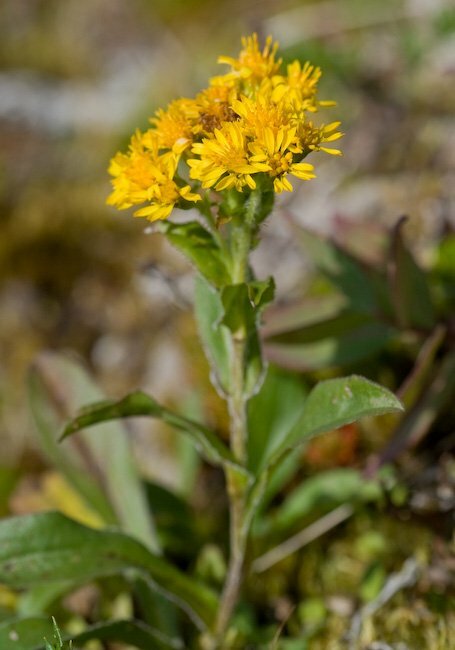 These included Northern Star Flower, Broad-petalled Gentian, Arrowleaf Groundsel, and Subalpine Daisy. Noticably absent was fruit on the Dwarf Blueberry plants. The last time I was up this way (August 2004), there were a lot of blueberries. It made me wonder whether plants can sense how late in the year it is when they are exposed during heavy/late snow years and forgo investing the energy in blooming and fruiting when it is unlikely to be successful. It seems plausible that they could do this by responding to the photoperiod. It strikes me that it might be a useful adaptation for plants above the treeline. Other plants seemed to suggest this possible also. I saw several plants that gave no indication that they had bloomed. I guess it’s possible that in some cases they just have not had enough time to develop flowers this year. Another thing that struck me today was how much things changed around 3500 feet. This is about the elevation where bare rock started to dominate the landscape. I assume snow/cold at this elevation prevents the plants that form a ground cover a little lower down from getting well established. 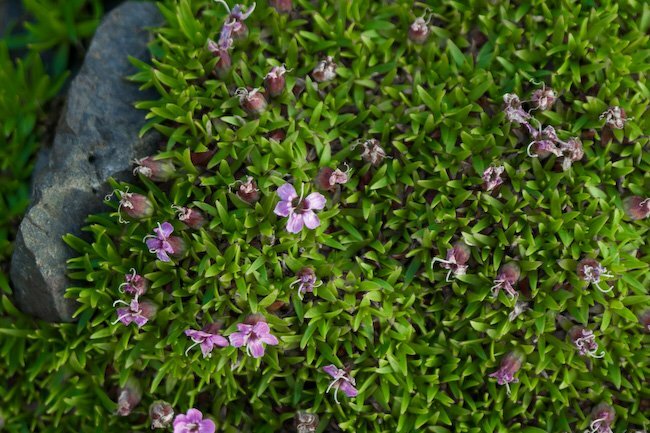 Perhaps this defines true alpine from subalpine habitats. 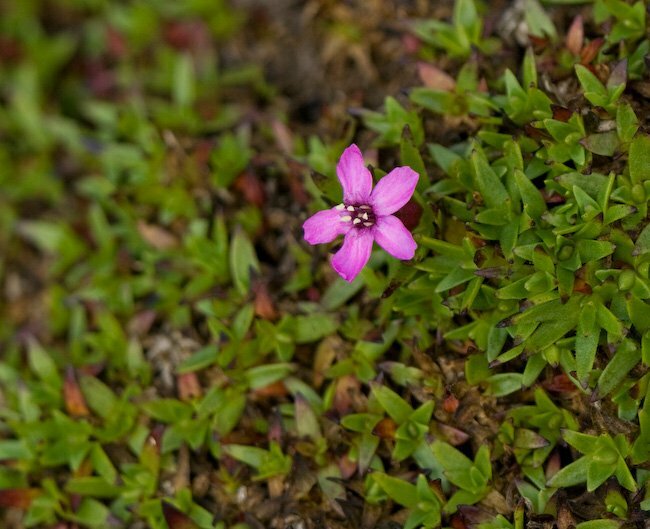 In this habitat, there are scattered plants growing, but the most lush microhabitats are seeps where snow melt from above provides consistent moisture. Saxifrages especially seemed to favor these locations (more on them in a subsequent entry). There at least a couple of species that I only noticed along the summit ridge at 4000 feet or so. I wonder why this is. 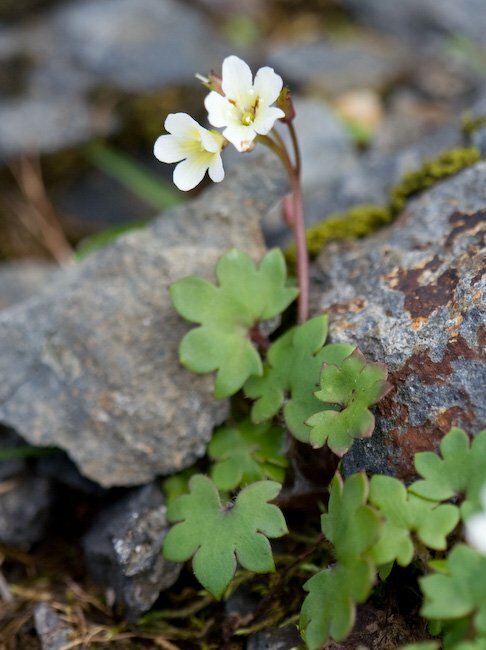 There are certainly rocky outcrops and such that, to my eyes, don’t seem all that much different than these higher elevation locations, but there did not seem to be any of these alpine plants growing there. I guess it’s possible there are some subtle differences in aspect/slope or something that make a difference. It’s also possible I just didn’t look in the right places. One other thing I did note was a few trees scraping out an existence well above the treeline. I saw isolated Sitka Spruce, Mountain Hemlock, and Sitka Alder at various points 1000 feet or more above the tree line. Below are thumbnails of several species I have seen before (click to see larger image), with comments about them. This is fairly easy to find in low elevation disturbed locations, but I do not remember seeing it up high before. 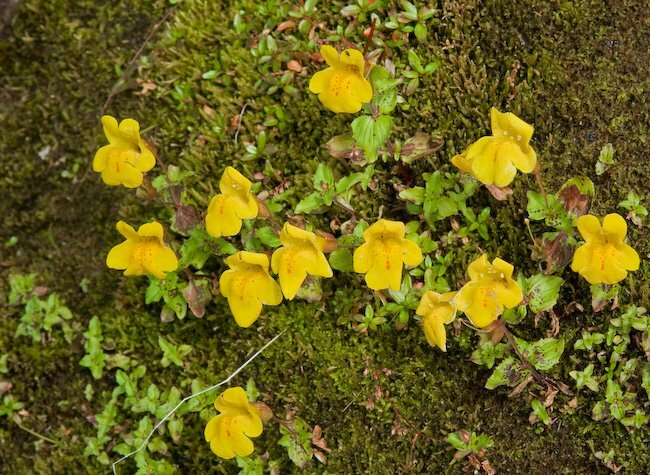 These were growing on a seep at around 3500 feet, well above the treeline. Another plant I have seen in disturbed locations at low elevations (river gravel bars, especially). Given the name, I am not surprised it grows up high, but I believe this is the first time I have noticed it. This also was growing at approximately 3500 feet. 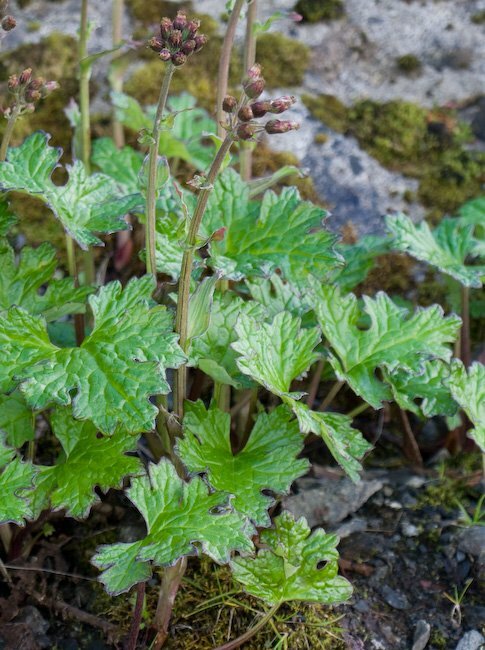 Yet another plant that I have always associated with streamside habitats. 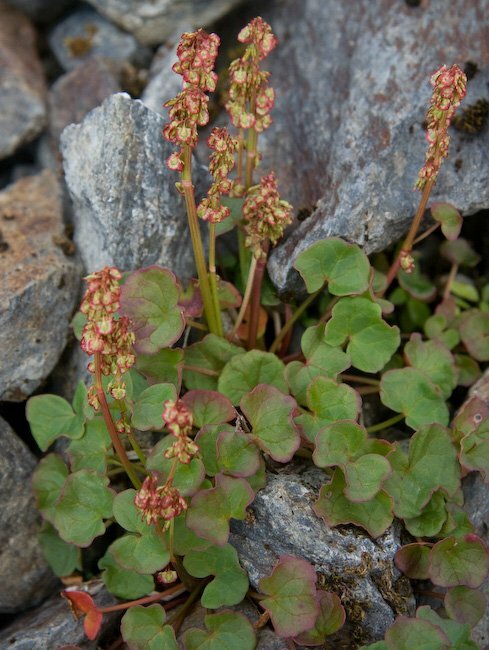 This plant was fairly easy to find above around 3500 feet. With plants such as this, I wonder if there are intermediate elevation examples, or if they grow only at low and high elevations. 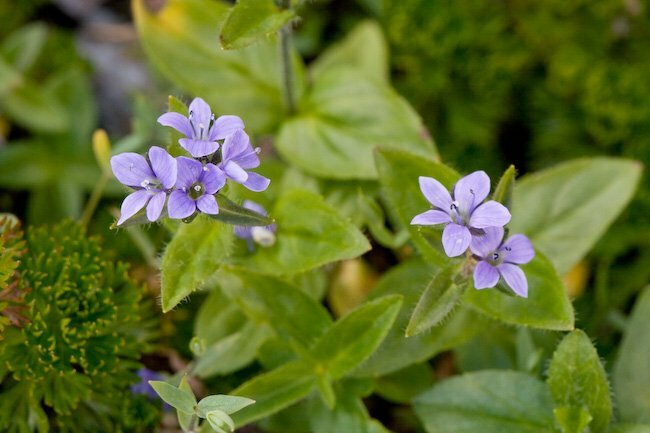 The two louseworts are fairly common subalpine plants. I saw both growing from near the treeline up into the alpine. 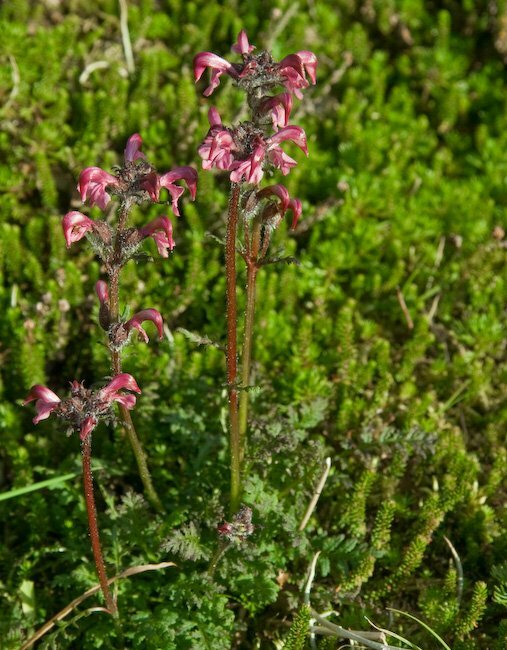 My recollection is that the Whorled Lousewort was growing higher up than the Bird-beak Lousewort, though I did not pay enough attention to be sure. I have noticed this before on Starrigavan Ridge and the bowl between Picnic Rock and the summit of Mt. Verstovia. This particular plant was growing at close to 4000 feet in a seep. I only noticed it in one or two locations. This is only the second time I have seen this plant. The first time I saw it was on the north side the summit of Mt. Verstovia (well below the summit, actually). This trip I saw it several times before I realized what it was. I pretty much missed the blooming, and the leaves and growth form were less familiar to me. Finally I realized what it was. The first photo shows what I typically saw, with bloomed out flowers. The second shows the one flower I found still blooming. I think I started seeing this species a little below 3500 feet, and it was present as high as I made it on the mountain. I’m not absolutely certain about this identification and would welcome any necessary correction. 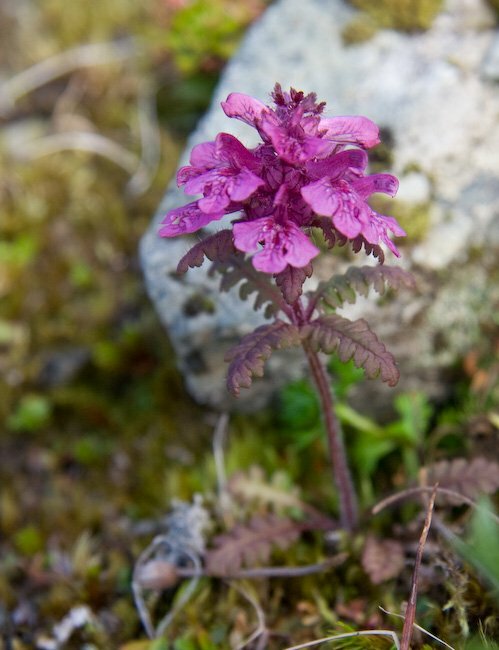 It’s a fairly common plant of subalpine meadows. This particular plant was growing at around 4000 feet. This entry was posted in alpine, flora, hiking, photo. Bookmark the permalink.